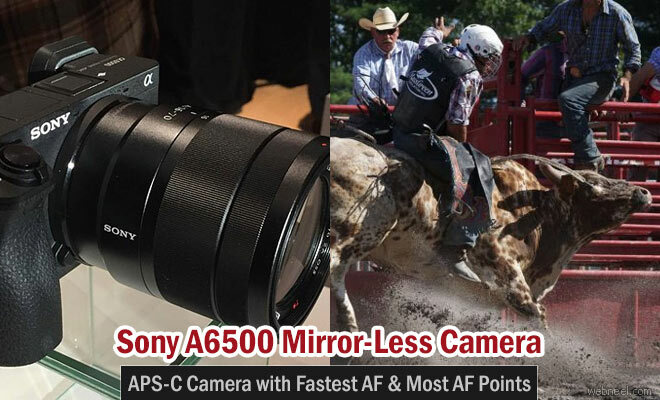 Sony has just launched its new a6500 camera on October 6th 2016, the company's flagship APS-C mirrorless camera with the world’s fastest AF speed and highest number of AF points among cameras of its category. It gains five-axis image stabilization and touchscreen focus control. The camera is a 24.2-megapixel Exmor CMOS sensor with a BIONZ X processor. The native ISO range is 100 to 51200. The Touch Pad function lets you shift the focus point smoothly by swiping a finger on the touchscreen, even while viewing the viewfinder. With 425 focal plane phase-detection AF points helping to provide distinctively wide and dense AF point coverage, the a6500 focuses accurately, efficiently and reliably on subjects throughout the frame. The camera enables you to zoom in on faraway subjects, snap detailed close-ups, capture night scenes and more all with minimal camera shake blur. aster internal processing and a higher-capacity buffer memory now allow up to 307 images (over 36 seconds)of high-speed continuous shooting. Price : The a6500 will be available for $1400 in the end of November .